Usually, my rants are on subjects that I know inside out. Today’s rant is going to be on a subject about which I know just enough to make an idiot out of myself, and I’m OK with that. 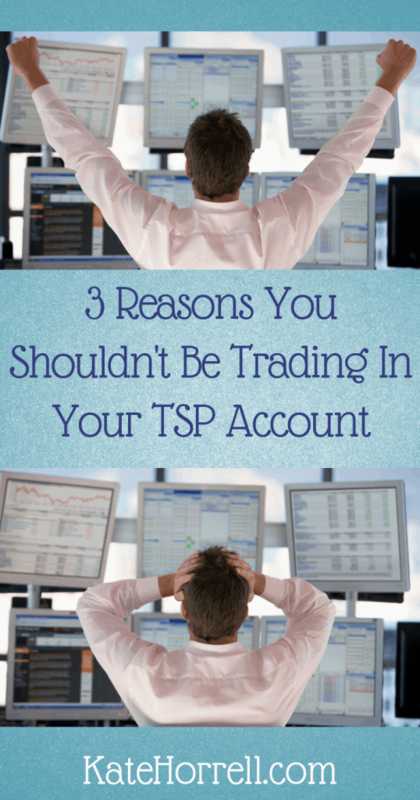 Lately, I’ve been running into more and more people who are using their Thrift Savings Plan (TSP) account for more active trading. They’re trying to beat the fund indexes by moving in and out of the different funds. Basically, they’re trying to time the market with a tool that’s 100% unsuitable for the goal. Limited transfers authorized: Inter-fund transfers within TSP are limited. You may only redistribute your account balance amongst all the funds for your first two transfers of the month. Any subsequent transfer made in the same month may only move money into the G fund. “The TSP is a daily valued plan which means the value of your account is determined each business day based on the daily share price and the number of shares you hold in each fund. These three aspects of TSP make it an unsuitable tool for anything that even vaguely resembles market-timing, regardless of whether you’re trying to catch smaller fluctuation or big swings. Don’t get caught up in the hype of earning an extra $3.42 by risking your well-thought out investment strategy. If you must try to beat the markets, then limit your ‘brilliant investor’ fund to 10% of your asset allocation and use a brokerage account designed for trading, not your TSP. Many thanks to Doug Nordman of The Military Guide for making sure that I said all these things right! He’s a lot smarter than I am when it comes to investing. There are groups dedicated to this. As well as some individuals recommending shifts in allocation. There is a subscription service that claims better returns if you follow their software generated recommendations. I can’t remember the name. People have been doing TSP timing for quite some time, For some reason I do tend to run into it in waves. They time it right a few times or they perceive they did, and they think that means they have some expertise. Hopefully they are right, but statistically they are not. It’s some consolation that this nonsense is unlikely to cause anyone to lose their entire TSP portfolio. I think. Or I hope. Although I never tried it, my partner who actively studied the markets and traded in our brokerage accounts did actually manage to allocate within his TSP accounts and do very well. I credit this to his immersion into the trading landscape and his understanding of the time delay with TSP allocation changes.